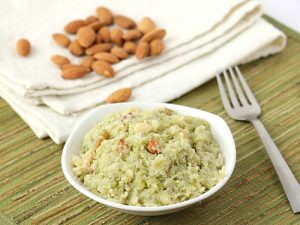 Festive season is still on and you don’t have to get off your health goals with the guilt free version of dudhi halwa! -Add ghee to a a pan. Fry nuts until golden. -Add the bottle gourd and sautéed until soft. -Add coconut milk and sweetener. Keep stirring until the milk boils, the mixture should not stick to the pan. -Let it simmer further until it turns thick and creamy. -You can garnish with more nuts (crushed almonds/pista). Cool it and serve. Tip: You can also replace coconut milk with cream for a richer texture.